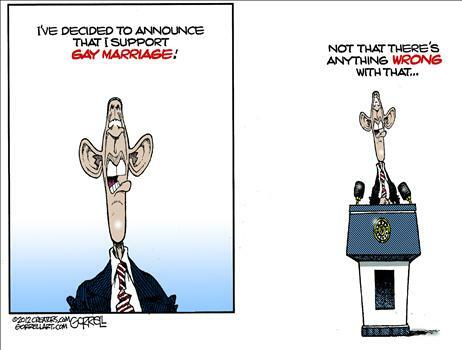 President Obama’s declaration last week that he approves of gay marriage was no surprise to me. In fact, anyone who really believed he wasn’t in favor of it had to be living in a fantasy world. His worldview, which is mainstream radicalism, naturally leads him to it. His professed faith, which departs severely from Biblical roots, is no barrier to it. Already we had seen his administration, through the Department of Justice, refuse to enforce the Defense of Marriage Act, which was passed by Congress and signed into law during the Clinton years. Attorney General Holder was quite vocal in his refusal. So why would the president’s pronouncement last week be a surprise? 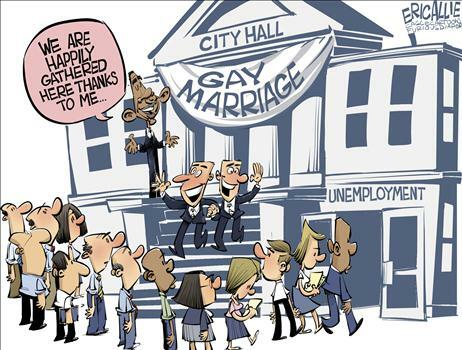 Some wanted to cling to Obama’s previous statements that he was not a proponent of gay marriage, but it should have been obvious to anyone with any critical sense at all that his stance was purely political. Now he has gambled that the nation has moved far enough left that it won’t be a detriment to his reelection. That remains to be seen. Last week, North Carolina became the 30th state to successfully define marriage as between one man and one woman, despite polls that indicate a majority of Americans now support homosexuals getting married. Are those polls accurate? Those polls I mentioned above could be accurate. We are a nation adrift morally, and it might be true, after a couple of decades of a constant barrage of subtle brainwashing, that most Americans now accept the idea that homosexuality is just a normal way of life for some people, that there is a genetic base for being a homosexual. Unfortunately for those who have jumped on this bandwagon, there is no scientific evidence for any kind of homosexual gene. They are believing a lie. For this reason God gave them over to degrading passions; for their women exchanged the natural function for that which is unnatural, and in the same way also the men abandoned the natural function of the woman and burned in their desire toward one another, men with men committing indecent acts and receiving in their own persons the due penalty of their error. And just as they did not see fit to acknowledge God any longer, God gave them over to a depraved mind, to do those things which are not proper, … and although they know the ordinance of God, that those who practice such things are worthy of death, they not only do the same, but also give hearty approval to those who practice them. The clear message of Scripture is that homosexuality is unnatural and is a choice; therefore, those who choose to engage in homosexual behavior will suffer consequences for doing so. The last part of the passage is quite fitting for our times when it points to those who not only practice it, but who also push to make the abomination tolerated, and even applauded. For the lips of a priest should preserve knowledge, and men should seek instruction from his mouth; for he is the messenger of the Lord of hosts. But as for you, you have turned aside from the way; you have caused many to stumble by the instruction; you have corrupted the covenant of Levi. Christians who refuse to call a sin what it really is are misleading others; they are causing others to stumble in their spiritual walk. That’s a serious accusation, but I feel it must be made. Too many who name the name of Christ are at peace with the world’s way of thinking, and they lead others into confusion and sin when they mishandle the Word of God. Sadly, that’s exactly what some self-styled Christian leaders are doing today. And then they make their own disciples who go out and do the same. The error spreads, along with the consequences. What would be even sadder is if a Christian would vote for a president who has done such a thing. There are many reasons not to allow Obama a second term, but he has now committed an act that should make every Christian reconsider a vote on his behalf. If we vote for him, we are giving our support to this evil. We will have to answer to God directly for that vote.